For more than 140 years, Banker & Tradesman has been Massachusetts’ most trusted source for news, insights and analysis among local real estate and financial professionals. As a result, the newspaper is considered one of the most valued advertising vehicles in the region by providing a one-of-a-kind outlet for companies to grow their brands. Banker & Tradesman prides itself on its compelling content. The Warren Group’s staff writers are well versed in their areas of expertise, and provide unique insight into the ways key sections of the marketplace and economy interact. 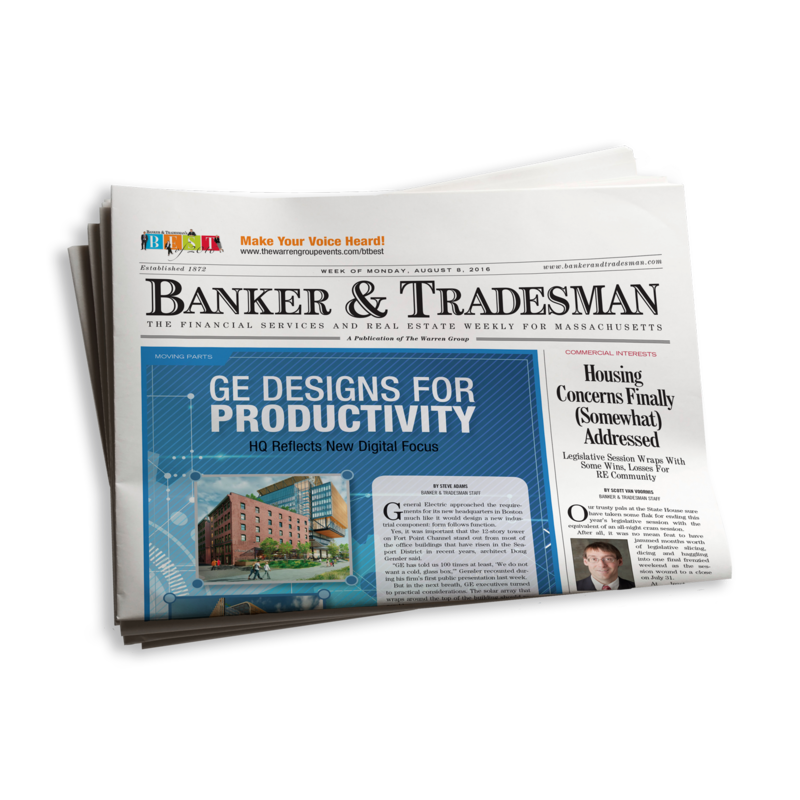 Every issue of Banker & Tradesman features a weekly review of the hottest topics from our daily web coverage. Regular features also include By the Numbers, a collection of information and developments for a selection of Massachusetts counties and towns, and the renowned Records section, which is the premier source of information for real estate and mortgage transactions in the state, including foreclosure deeds and credit defaults. Banker & Tradesman is a vital tool for real estate and financial professionals throughout The Bay State. Current and accurate data is paramount for getting ahead in both industries, making a reliable source for complete real estate transactions and listings very important. We also feature a highly-rated website, bankerandtradesman.com, and a popular daily E-news Alert with more than 10,000 subscribers. The money for your real estate purchase, development or business expansion is out there. Learn how to navigate the new landscape to get it. The year has closed and the facts are in: Banker & Tradesman takes a look at how the residential market performed in 2018, utilizing statistics from its publisher, data analytics firm The Warren Group. Featuring the leading lending institutions of the year in the real estate finance industry; every day these companies put in the hard work to fulfill their clients’ goals. We break down the lending landscape by type of lender and type of loan. Industry experts discuss key issues affecting the residential real estate market and offer their insights about prospects for the Massachusetts real estate industry this year. With so many uncertainties in the mortgage industry – from regulatory changes to compliance issues – it’s impressive to see who performs at the top of the field. Check out our top loan originator rankings by county across Massachusetts. A special mid-year look at luxury condo and apartment building – and what happens after the deeds and leases are signed. Featuring analysis derived from The Warren Group’s new statistics module. Year-in and year-out, dozens of mortgage lenders set themselves up for phenomenal growth. We recognize the fastest growing lenders in the industry and applaud them for their accomplishments. .
Another spring market has come and gone – which towns saw the biggest gains, and which the biggest losses? Where were the unexpected hot spots and underperforming markets? Analysts expected the recovery would continue for another year – were they correct? The much-anticipated annual reader poll results issue, honoring the BEST vendors in the Massachusetts real estate and financial markets. The fifth annual celebration of the philanthropic and charitable donations from readers, contributors and vendors over the course of the year. Industry News – News and trends in the banking, real estate and financial services scene. Records and Research – Statewide real estate and credit records transactions compiled weekly for easy reading and analysis. Print Exclusives – Print-only features, like By The Numbers, Hot Property and Gossip Report. Special Supplements – Hone in on industry-specific topics, such as commercial real estate, law, housing and banking. Real Estate Investors, Real Estate Brokers, Real Estate Developers, Builders & Contractors, Commercial Property Owners, Bankers & Lenders, Mortgage Bankers & Brokers, Government Agencies, and Real Estate Professional Services including Legal, Insurance, Accounting and Appraisal. Need to hit the marketing refresh button? We’ll help you do that. The Warren Group creates email, direct mail, and advertising campaigns to promote your services. From concept to implementation, we connect brands with customers. Our talented design team will walk you through the complete redesign, branding, logo creation, stock/custom photography and web development process. As a plus, our long-standing relationships with printers allows for aggressive pricing. The Warren Group has a rich history in developing and delivering successful solutions for our customers. Through the years we have committed ourselves to helping businesses identify new prospects and reach their goals. It is with this passion and experience that we embark on our new journey by providing our clients with the very best in creative services. Our team will challenge the way you see things, so you get real results. Annual Reports & Brochures Provide design concepts, photography, and infographics that match your image. Corporate Identity Develop logos and corporate rebranding initiatives. Copywriting Research and create compelling content for marketing initiatives. Advertising Campaigns Create unique print and web ads that align with your company’s brand standards. Email Marketing Create direct email campaigns that generate leads and provide measurable results with extensive reporting. Direct Mail Campaigns Create content and design a marketing piece that’s delivered to your best prospects with a trackable response vehicle. Press Releases Research and generate content that drives interest. Brand Audit Research competitors, review all current branding collateral, and develop a new brand strategy. The website has a brand-new, sleeker design, and is now mobile optimized, featuring real estate, banking and lending, and construction and development information. The combination of industry news and weekly real estate transaction listings are an invaluable tool that empowers readers to make the best possible business decisions. Subscribers also have full access to the digital newspaper online. We average 9,000+ weekly visitors and 5,000+ page views. Our brand-new reactive moving advertising options guarantee your message will be seen. Delivered to approximately 10,000 people, the daily E-news Alert links directly to The Banker & Tradesman website, averaging a 20% open rate and 3.5% click-through rate per issue. Our audience uses the daily e-blast to stay up-to-date on the news that matters most to them. We’re constantly adding new recipients to the distribution list. Be a part of the headlines as we deliver the digital version of banking magazines to our audience. Your story description can bring interested bankers right to your website to learn about the latest industry trends and products. Be a part of our headlines on the BankerandTradesman.com website and on the daily E-news Alerts. Your headline, image and description blends with the flow of our content on the website and E-news Alerts. Grab the reader’s attention and bring them back to a targeted landing page on your site for the full description of your expertise and services. All magazines have an accompanying digital version, which includes live links for URLs and email addresses. Digital versions are sent to readers via interactive emails, which also include advertising opportunities for you. Deliver your message as the front cover of the digital magazine with a Belly-Band as it is delivered to thousands of computers, tablets and smartphones. Today’s marketing landscape requires a targeted strategy that produces measurable results. Here at The Warren Group we understand your audience and can help you refine your message, identify your best prospects, and track your results. To learn more about Banker & Tradesman or to customize a marketing program unique to your business needs, call 617-896-5307 or email advertising@thewarrengroup.com.